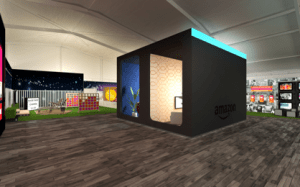 For the first time, Amazon FireTV will bring an exciting new activation called Fast Forward to the Future to San Diego Comic-Con (SDCC). 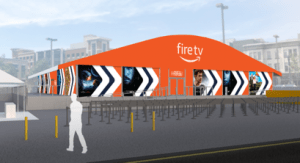 This activation will be a hands-on, immersive experience which will showcase the New Fire TV Cube, the evolution of television, and immersive lounges featuring fans’ favorite television shows such Game of Thrones as well as new entries such Tom Clancy’s Jack Ryan. This activation is located off-site at the corner of 7th Avenue and Market Street. It will be open from 9 AM until 6 PM Thursday, July 19th through Saturday, July 21. On Sunday, July 22nd, it will be open from 9 AM until 5 PM. An SDCC badge is not required to attend. Fast Forward to the Future will take you on a journey through the evolution of television, showcasing how Fire TV now makes it easier than ever before to watch all of your favorite TV shows and movies, control smart home devices, use Alexa skills, listen to music, and more. The activation includes vignettes like the “Device Garden,” where antiquated technologies will be given a place to call home; a graveyard of sorts to commemorate devices we once knew and loved before they were overshadowed by newer, more user-friendly technologies. Hang out in the “Backyard Cinema Club,’ where you will be able to try the Fire TV Stick in a reimagined outdoor theater created from retired VHS tapes. As an homage to all the fan-favorite content available on Fire TV, you will also be able to take a stroll down “Fire TV Street,” where you can uncover hidden photo moments and surprises along the way. 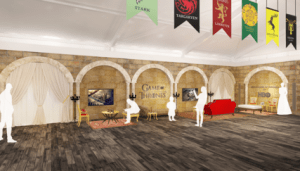 To top it all off, the reimagined neighborhood will dedicate a corner of the block to Comic-Con’s most prized-possession, HBO’s iconic Iron Throne. 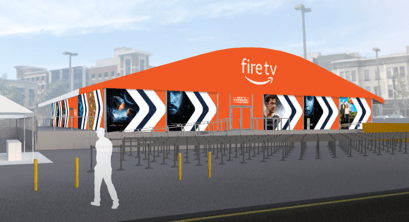 After stepping through a 16 foot Fire TV home screen, you will enter the “Stress-Free Streaming” zone where you can unwind with some of your favorite shows. The silent streaming party will bring the Fire TV experience to life with immersive lounges inspired by hit shows from partners including Prime Video’s “Tom Clancy’s Jack Ryan,” HBO’s “Game of Thrones,” and NBC’s “The Good Place.” In addition, you can recharge with readily available mobile chargers and a tempting selection of show-themed mocktails to sip on. Are you interested in participating in this offsite? Click here to join the conversation on the FoCC forum.